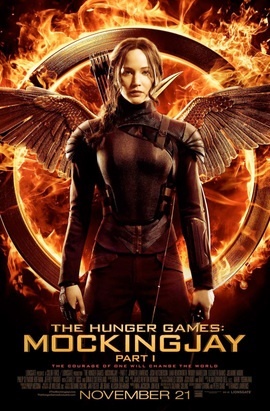 It’s days of whine and poses as Jennifer Lawrence’s Katniss Everdeen trudges along to the prolonged conclusion of Francis Lawrence’s excruciating The Hunger Games: Mockingjay – Part 2 (D+). For a heroine who came on the scene so strong in the original film, it really was a long slog through three more movies to drain the character of any recognizable character whatsoever. After treading water and biding time for more than an hour, the film introduces an oil spill sequence and a slime-zombie battle to rattle the narrative out of complete somnolence. The plot to assassinate President Snow (Donald Sutherland) meanders and fizzles; the inexplicable Peeta versus Gale fauxmance wobbles into utter nonsense and the whole enterprise just teeters to the finale. Aimless in direction, bleak in set design and imagination and largely existent to squeeze more money out of the franchise, this sequel is notable for career-low wooden performances from Oscar winners Lawrence, Julianne Moore and the late Philip Seymour Hoffman. For completists only, this part four is a complete bore. The first act of director George Miller’s latest post-apocalyptic epic left me a bit mixed on Max, but as the propulsive parade of vehicular adventure progresses, it became clear that we do indeed need another hero. 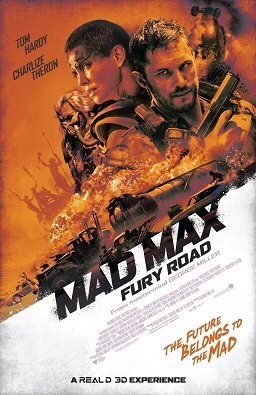 The adrenaline filled reboot Mad Max: Fury Road (B) is precision tuned in its breakneck stunt work, gloriously specific in its troupe of odd denizens aboard citadel towers and on monster trucks and near operatic in its pacing with few words punctuated by Junkie XL’s thrilling percussion and guitar. Ridin’ dirty in lead acting roles are Tom Hardy and Charlize Theron; and despite their character development coming a bit too little too late, they are strong physical actors for the journey. The film contains unexpected subtext about female empowerment as Theron’s character is delivering the villain’s wives to safe territory, and she is fierce in the role. Sequences with near-impossible odds, such as when Max is fighting with one arm chained to a car door and the other cuffed to a comatose man, showcase Miller’s strong action instincts in their rawest and most entertaining form. Hardy reclaims road warrior-dom from white collar execs and flexes uncanny instincts even when his character is going from one unpleasant challenge to another. Filmed in an orange hue that would make John Boehner envious, it’s a visceral ride into a thunderous domain. It’s becoming abundantly clear that Jennifer Lawrence’s protagonist is much more interesting as a fighting archer than a reluctant war propagandist, but the protracted franchise must march on to rebellion and more box office receipts. Francis Lawrence’s The Hunger Games: Mockingjay – Part I (C-) is one of those creaky transitional episodes in which much is promised for a grand finale, but not much actually happens within the actual film. Given the blank line readings by all involved, it could easily be Attack of the Drones: Julianne Moore, Donald Sutherland and Woody Harrelson are not immune to the film’s reverse-trackerjack of deadly dialogue. 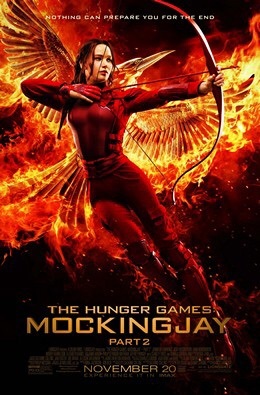 The film’s final act, which is ostensibly the middle stuff of a drawn-out two-part treatment of one book, enlivens a bit, with some legitimate battles and even a mildly pleasant honkeytonk number delivered by Miss Katniss to break up the talky treacle. Largely missing are the futuristic flourishes, sinister surprises or even tender touches that marked the series’ earlier installments. Josh Hutcherson gets scant screen time as the series’ inexplicable love interest, and Liam Hemsworth might as well be a hologram given how little our heroine regards his flesh and blood series of manly sacrifices for her (lil’ bro of People Magazine‘s cover-hunk just can’t get past first base). It’s telling that one of the plot points revolves around Jennifer Lawrence’s heroine being an unconvincing actress and needing to improv a bit in real-life dramatic situations to make her rebellion propaganda seem authentic. Perhaps that capable A-list acting will come in Part 4, er, Part II. Most of what happens in this subpar story could have been summed up in a quick prologue to the finale. 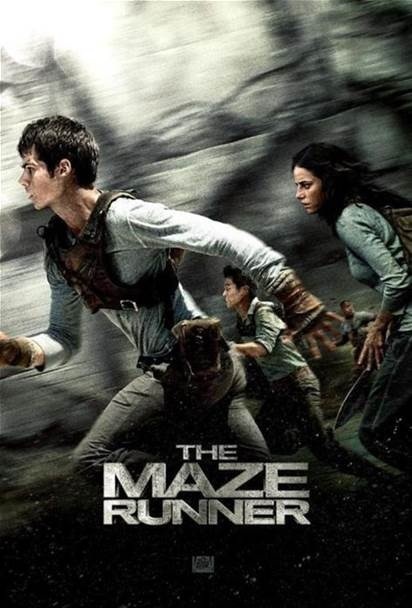 There’s an intriguing story buried within the Lord of the Flies/Hunger Games/Prison Break mashup that is Wes Ball’s The Maze Runner (C-), but boy is the execution a tedious zig zag tracing some well-trod lines we have seen many times before! An all-teen-boys village of the future requires runners to scope out a maze each day in hopes of finding a pathway to escape (maybe they think there are girls on the other side?) There aren’t Minotaurs in the labyrinth but rather a selection of sinister electric spiders that attack at night if you get trapped in the maze’s doors that close at sunset. A preposterous young adult novel plot really needs an amazing lead actor to add gravitas to the proceedings, and alas the stoic Dylan O’Brien fails to fill the screen with charisma as the new man on campus. The entire ensemble, to be fair, is really quite dreadful in both talent and appearance, representing each cliche available for the dead sprinters’ society and clad in Gap outfits that don’t give one the sense that the costume department really thought out what the dystopian future really looks like. Where is the White Squall casting director when so desperately needed? When a female character (Kaya Scodelario) finally shows up to add some much-needed gender politics to the Katniss Ever-Peen mix, she’s as cardboard as the rest and gives the affair all the excitement Smurfette provides to a Peyo tale. To the film’s credit, there are several really heart-stopping action moments and a few elaborate set pieces of note, although nothing much better than you’d find on a typical episode of Lost. The doubting antagonists are insufferable, the Piggy-esque sidekick grating and the multiple trick endings stupefying. The final reel felt like a big set-up for a better sequel when the cast members have all completed their acting boot camp. There are endless possibilities about how this film could have been rendered with more panache. 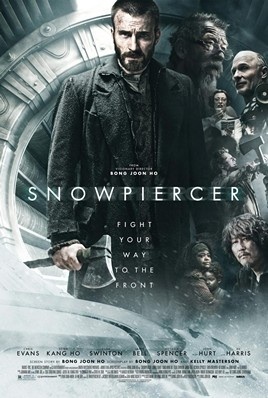 A dystopian sci-fi action film about a rebellion aboard a train carrying the last survivors of an uninhabitable future earth, Bong Joon Ho’s Snowpiercer (A-) is a corker of a thriller with twists around each and every turn. Chris Evans as the reluctant hero has never been better, and Tilda Swinton is inspired casting as a vampy villainess. Darker and artsier than most mainstream fare, this is a triumph of production design with a series of staggering moral choices that provide an adventure for the mind. Each train car unlocks amazing visual treasures or shocking discoveries, and it’s a testament to all involved at what a spectacular steampunk world has been so thoroughly rendered within its lengthy locomotion. Although it can’t quite hold its amazement through parts of the final reel, it genuinely ups the ante and delivers a robust journey. Amidst the genuine excitement of downtrodden denizens’ quest to reach the front of the train and possibly unseat the rule of a sinister regime, there is significant commentary on class structure and what people will do to survive. This is sci-fi of the first order, imagining genuine possibilities with complex and distinctive emotional grandeur. 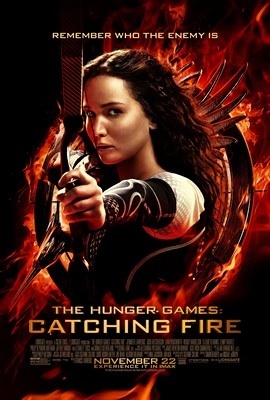 The second of the Hunger Games films is called Catching Fire (C-). It rarely does. Director Francis Lawrence’s unremarkable style can best be described as a cloud of smoke that poisons most of the charm and intrigue right out of the dome. When this sequel bothers to do more than simply retread the formula of the vastly more entertaining first film, it presents second rate drama, middling adventure and a love triangle most tepid. With major character traits a side pony and archery ability, Jennifer Lawrence’s Katniss breathlessly bemoans her status in her dystopian future. She’s hardly got her heroine hat on. Josh Hutcherson’s unleavened performance as Peeta is basically little more than a damsel in distress role. And the plot and screenplay? Pure jabberjay! Note: This movie was filmed in Georgia. Thanks to friend Jay Croft and StoryCroft blog for the mention of our site. Gary Ross’ The Hunger Games (B+) imagines a dystopian future in which territories of our modern land have to fight against each other on live television as sacrifice and bloodsport for the ruling political regime. Jennifer Lawrence, our archer heroine, is ready to break all the rules as she enters the arena. The film has an interesting vocabulary and fascinating details, plus there are nice supporting turns from Woody Harrelson, Lenny Kravitz and others. It’s very high-concept, but I liked the way the protagonist handled the tablestakes.